WEBINAR: After Copenhagen: What Was Achieved? High up in the trees near the summit of Coal River Mountain, two activists dangle in the air near a mountaintop removal mine site. Eric Blevins and Amber Nitchman are still preventing the expansion of mining on the summit of Coal River Mountain, a mountain that has the best wind energy (and therefore economic) potential in the area. Eric and Amber didn't just stroll through the woods and decide to climb some trees. Their action, like the dozens of others in the past year are a steady escalation of the Climate Ground Zero campaign. I first visited Rock Creek, West Virginia in October. Mountain Justice, now in its 5th year, organized a fall weekend that drew 150 youth activists from all over the country to the Appalachians to see firsthand the destruction of mountaintop removal coal mining and learn what they could do about it. For me, it was partly a reunion with colleagues from various climate and activist organizations making the trek, and partly a recharge. Camping in the cold, eating group meals and hanging out with my mountain roaming friends is a great way to spend a weekend. It's also a great way to build a movement. 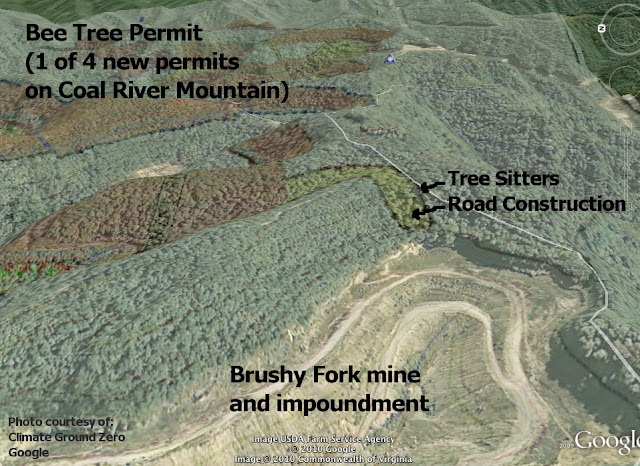 Mountaintop removal is the most destructive and least labor intensive way to mine coal. It is impossible to restore stream ecosystems, forests and landscapes where thousands of acres are scraped away. It also injects poison into drinking water and streams, puts dust in the air and denudes the land. This form of mining relies on large machines, resulting in a staggering decline in mining employment, even as the profits of its executives grow. The destruction and declining employment are not lost on the people of West Virgina, nor concerned people around the country who know the side of the story that Manchin and Blankenship don't want to make public. Keeping the rest of the country updated about southern Appalachia is low on the priorities of Massey coal or WV governor Manchin. In fact, both have pursued major PR campaigns to convince the country of the greatness of coal, using multi-million dollar budgets to try and outmaneuver the citizen groups fighting for justice. They know that an informed country isn't going to allow the destruction of over 400 mountains and 2,000 miles of stream. Lately, they're getting a little scared. Massey is taking their aggression out on the tree sitters. Eric and Amber have endured 7 days of air horns tied high up in the trees blasting at them 24/7 and flood lights shining on them all night. The base camp worries of permanent hearing loss, even if the sitters are using their ear plugs. Basecamp cannot ask the sitters to come down, its their own decision, so we don't know how serious the likely ear damage is. A film crew following the campaign hired a helicopter to survey the scene, providing photos of waving sitters and confirmation that Massey has put a lot of effort into intimidating the them into submission. Today, Governor Manchin met with the 81 year old Roland Micklem and several other representatives from the Climate Ground Zero campaign. Manchin called the camp personally on Wednesday to ask for the meeting. Also in attendance will be the "State Police and Raleigh County authorities to discuss concerns expressed by citizen groups that Massey's security guards are harassing and endangering the protesters," according to Ken Ward at the Charleston Gazette The campaign is reaching the people it needs to reach, but both parties are likely to have different conceptions of what the meeting is about. Governor Manchin asked the activists to scale down their campaign, reduce confrontations and generally de-escalate the situation. Earlier this week, he met with community members and called for calm in the coalfields, stating that the state "will not tolerate any violence on any side." He didn't say which side was more guilty of violence, but only one side here has non-violence written into their mission statement. I'll give you a hint: corporations typically don't describe themselves that way. Both Tuesday's meeting and today's are unlikely to result with Massey Energy stopping mountaintop removal, but they help raising the profile of the issue. Climate Ground Zero, as a non-violent direct action campaign, does not want to 'cool off', 'simmer down' or 'de-escalate' the situation. Some people confuse non-violence with pacifism or resignation. If anything, non-violence aggressively escalates situations until they are resolved. Governor Manchin making some bland statement to the press is not a resolution, and it will do nothing to deter the activists I have spoken to here. A day after meeting with environmentalists to address concerns about mountaintop removal mining, Manchin asked lawmakers to approve a symbolic resolution condemning federal cap-and-trade legislation and expressing support for investment in new coal technologies. 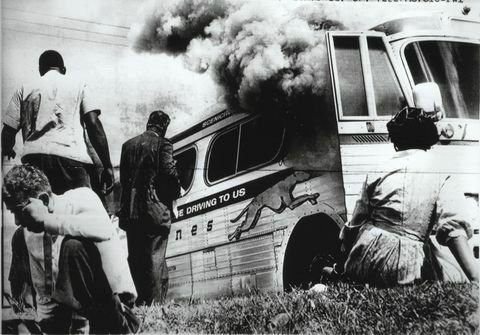 When the 13 Freedom Riders set off on a Greyhound from Washington to New Orleans, violence against them escalated along the way. It began with mild intimidation and grew to a fire-bombing and all-out mob beatings. Bobby Kennedy and his brother John were livid. They talked about their big concern for the riders even as they asked them to stop. Some of the older organizers were intimidated by the violence, but the younger freedom riders like John Lewis and Diane Nash chose to continue, to take the tactic to its conclusion and show the heart of the cruelty in Jim Crow. 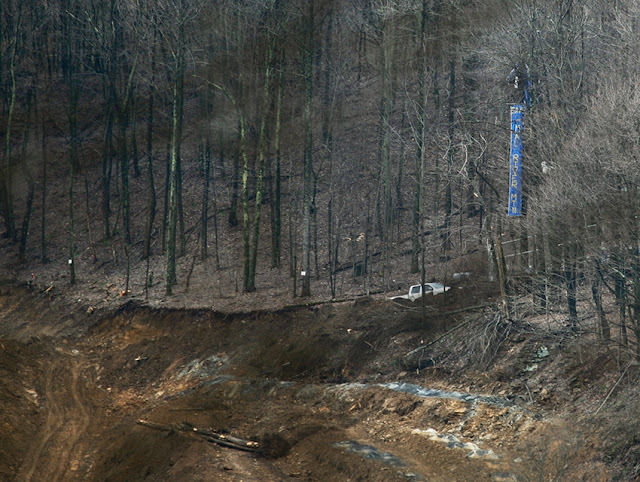 Governor Manchin is unlikely to stop mountaintop removal. He's in too deep with the coal industry and his state powers only extend so far. Unless his disposition changes wildly, he's also unlikely to take necessary steps to protect activists who are non-violently protesting mining practices. While this is speculation on my part, I'm not the only one. The feeling at the camp in Rock Creek is that federal intervention is needed, just like in the civil rights movement, to quickly end destructive mining and head off a much further escalation of an already tense situation. I'm not from Appalachia, but I'm drawn to the mountains and this major issue at the center of our struggle for solutions to climate change. The campaign, Climate Ground Zero, says it all. This is the epicenter of the most atrocious fossil fuel extraction practices in this country, and this is where the people will rise up and put an end to it. Keep your eyes on southern Appalachia in the months to come. The activists and the coal companies show no signs of stopping, but the arc of justice and economics are on the side of the two brave activists, still sitting 60 feet up in the trees near the summit of Coal River Mountain.